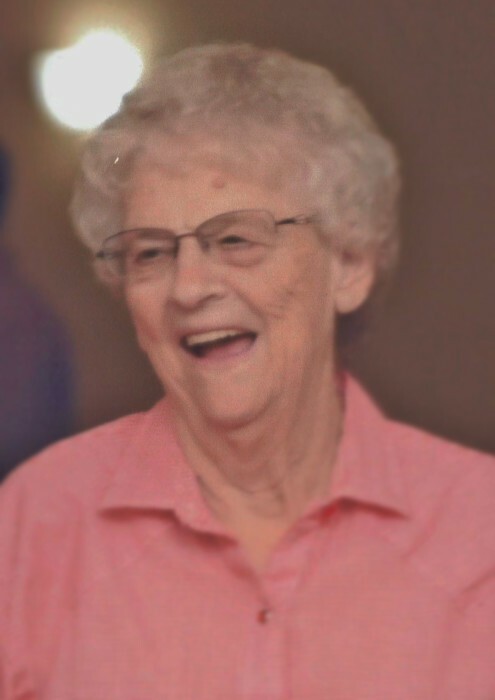 Donna Mae Kessenich, 87 of DeForest, passed away peacefully, Tuesday, January 29, 2019 at Maplewood Rehabilitation Center in Sauk City. She was born September 21, 1931 at University Hospital in Madison, the daughter of Lloyd and Gertrude (Statz) Oien. She graduated from DeForest High School, class of 1950. She was united in marriage to Thomas Kessenich on March 27, 1951 at St. Olaf’s Catholic Church in DeForest, They were the first couple married in that church! Together, Donna and Tom were blessed with nine children. They farmed in the DeForest area all of their lives. Donna loved spending time with her family, going to garage sales, dancing, playing cards, camping and traveling. She also enjoyed volunteering at the Red Barn in Sun Prairie. Throughout the years, they hosted numerous foreign exchange students from Germany. She is survived by a son Jeffery (Robin) Kessenich of DeForest; daughters Deborah (Ed) Laymon, of Baraboo, Cynthia Kessenich of Arlington, Lynn (Richard) Schiller of Gilberts, IL, Diane (Jon) Heatley of Ripon, Susan (Rob) Bailey of Sun Prairie, Beth (Harlan) Stiemke of Arlington, Mary (Jim) Doherty of Cambria, and Donna (Todd) Lockwood of DeForest; twenty-five grandchildren, thirty-five great grandchildren; four step grandchildren, and five step great grandchildren; sister Deat Kolman; brother-in-law Byron Kessenich; and sisters-in-law Faye (Tom) Farr, and Nancy Kessenich. She was preceded in death by her parents, her husband Tom on August 3, 2015 of 64 years, grandson Travis Hamilton; brother Robert Oien; sister Delores Hillestad, sisters-in-law June Oien and Janet Kessenich and brothers-in-law Richard Kessenich, June Hillestad and Ray Kolman. A memorial mass will be held Tuesday, February 5 at 11 AM at St. Olaf’s Catholic Church in DeForest with Father Vincent Brewer presiding. Inturnment will be held at St. Olaf’s Catholic Cemetery at a later date. Visitation will be held from 9 AM until the time of services at the church on Tuesday. A luncheon will be held following the service in the church hall. In lieu of flowers, the family will make donations to charities of their choice.